IV.2.a Pompeii. Caupona or workshop. Excavated 1841-3. IV.2.a Pompeii. March 2009. 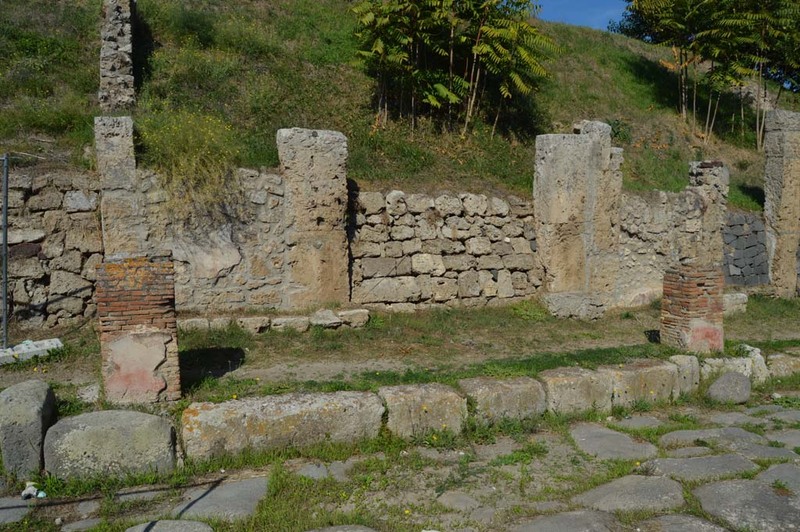 Entrance and small portico on Via di Nola, with two pilasters for holding up the balcony. 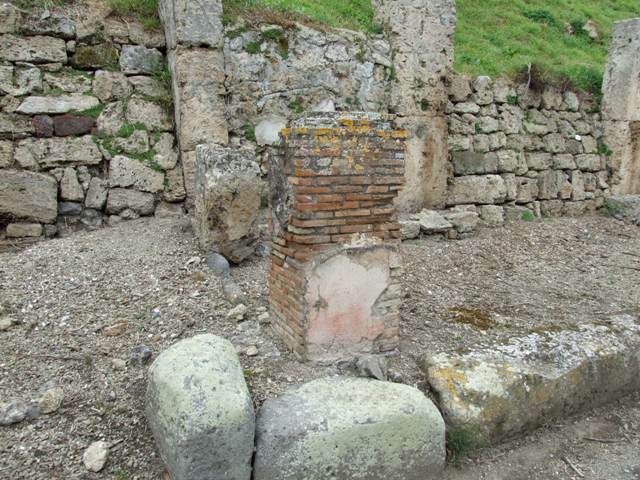 IV.2.a Pompeii. March 2009. 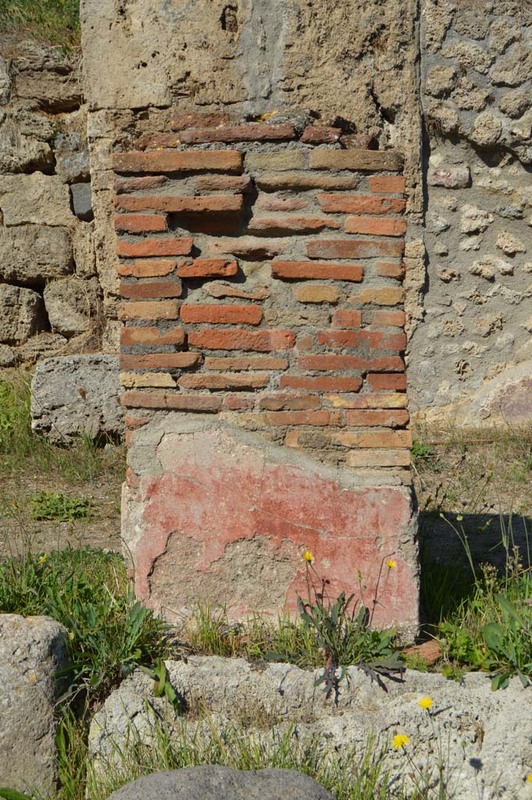 Pilaster with the remains of painted plaster. IV.2.a Pompeii. March 2009. Pilaster, with detail of painted plaster. 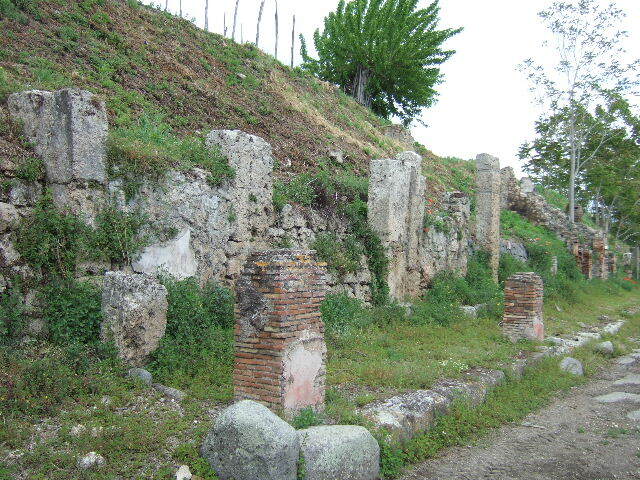 IV.2.a, IV.2.b and IV.2.c Pompeii. September 2011. 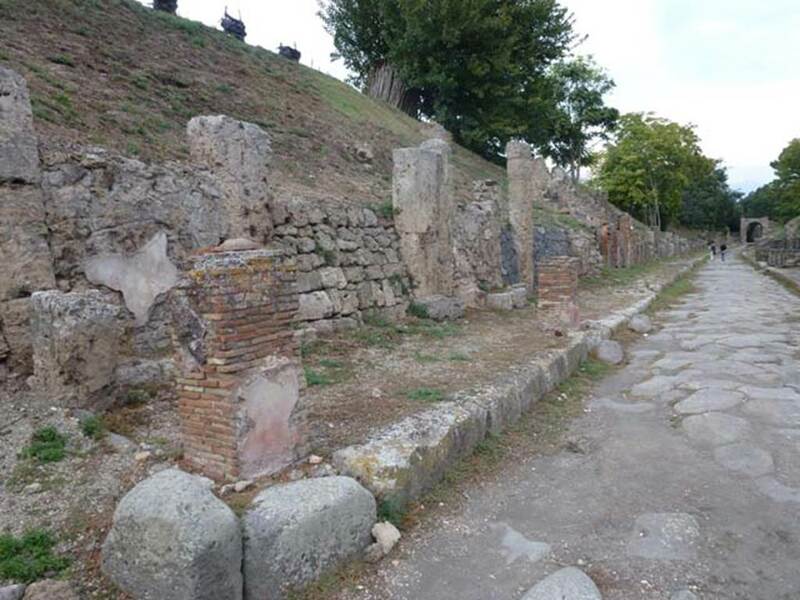 Entrances on north side of Via di Nola. Photo courtesy of Michael Binns. 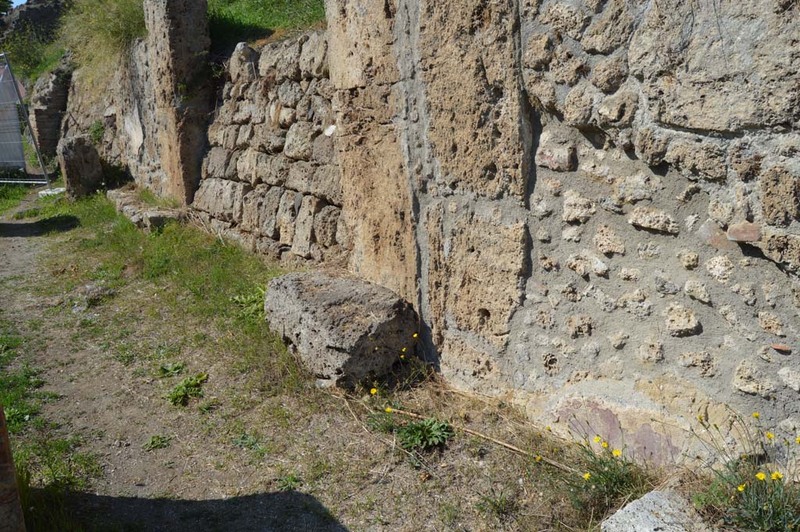 IV.2.a, IV.2.b and IV.2.c Pompeii. May 2006. 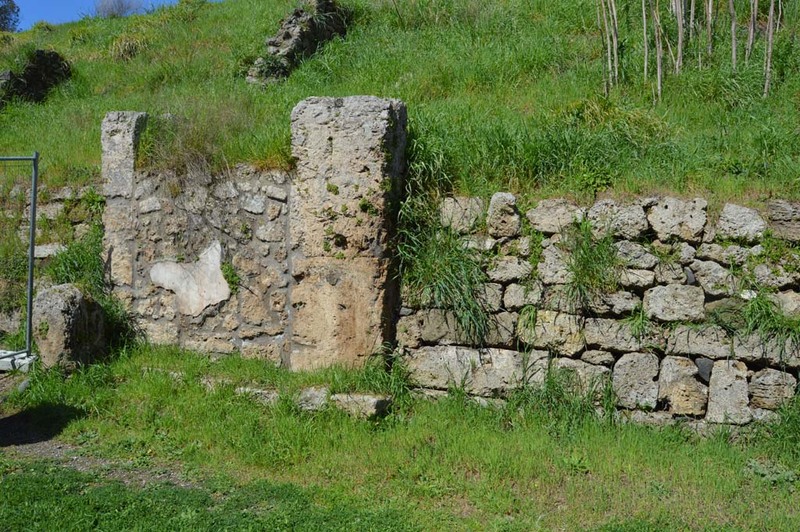 Entrances on north side of Via di Nola. IV.2.a Pompeii. March 2009. Entrance. According to Liselotte Eschebach, there was a Lararium painting here. This was a painting of Mercury with cloak, petasos (hat), winged sandals. In his left he had a caduceus and in his right a marsupium. In front of the god was an omphalos with a serpent winding around it. 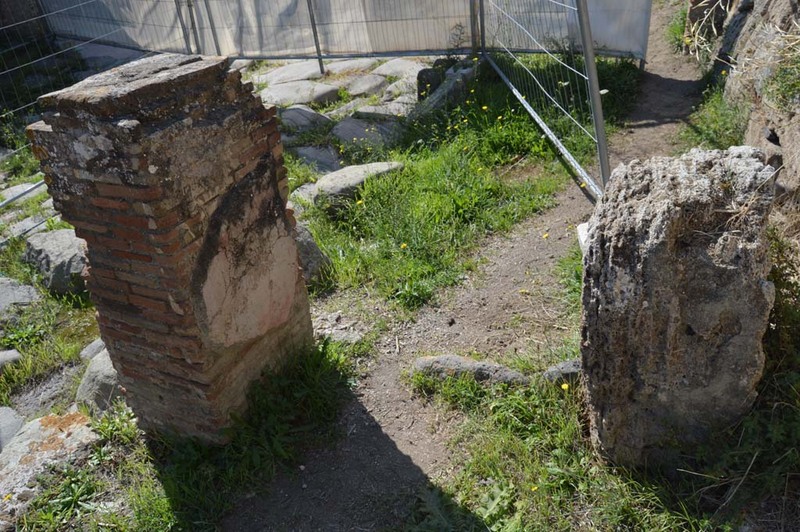 On the right was a high round pillar with a cockerel on top of it. She suggested this may possibly be F28 identified by Fröhlich as from Regio IV. See Fröhlich, T., 1991. Lararien und Fassadenbilder in den Vesuvstädten. Mainz: von Zabern. (p.316, F28). See Eschebach, L., 1993. Gebäudeverzeichnis und Stadtplan der antiken Stadt Pompeji. Köln: Böhlau. (p.116, IV.2.1). IV.2.a Pompeii. 1841 drawing by G. Abbate of lararium painting by entrance. This was a painting of Mercury running to the left, naked, wearing cloak, petasos (hat) and winged sandals. Now in Naples Archaeological Museum. Inventory number ADS 105. 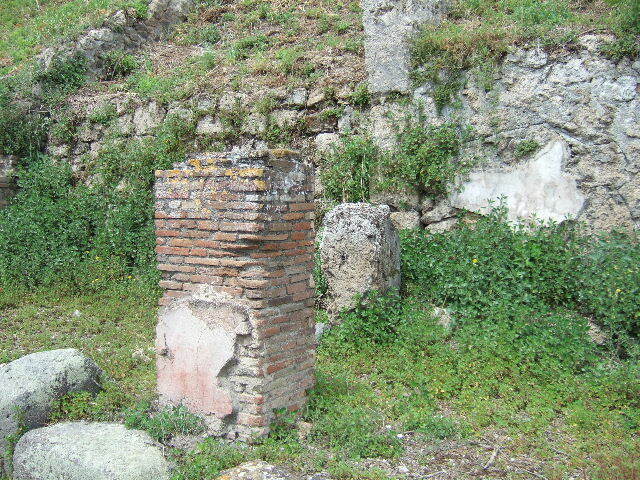 IV.2.a Pompeii. May 2005. Entrance. IV.2.a Pompeii. May 2006. Entrance and brick pilaster on east side of entrance. 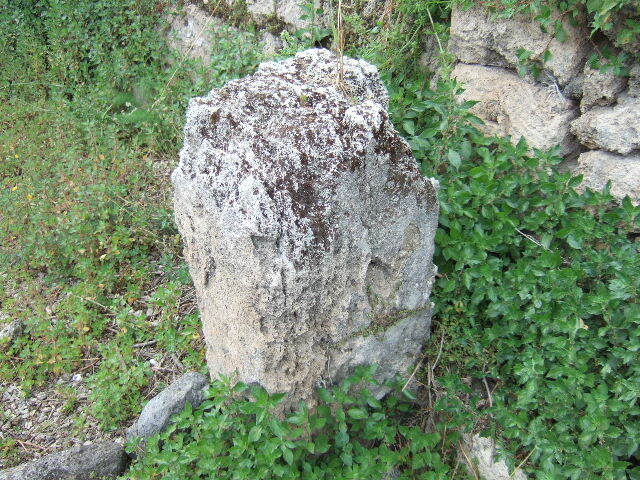 IV.2.a Pompeii. March 2009. 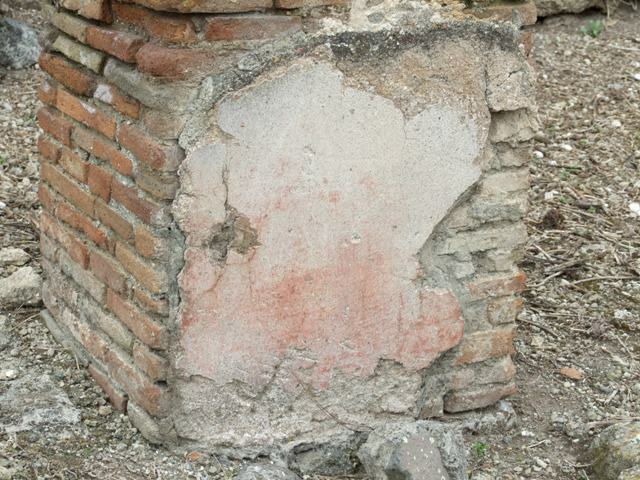 Remains of painted plaster on west side of entrance, at the rear of the portico. 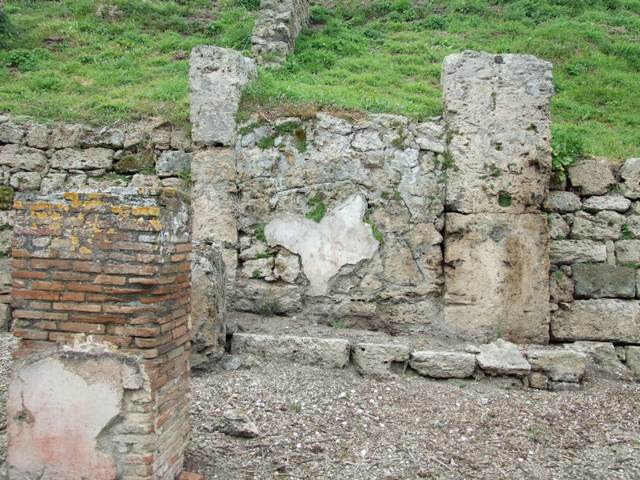 IV.2.a Pompeii. May 2005. 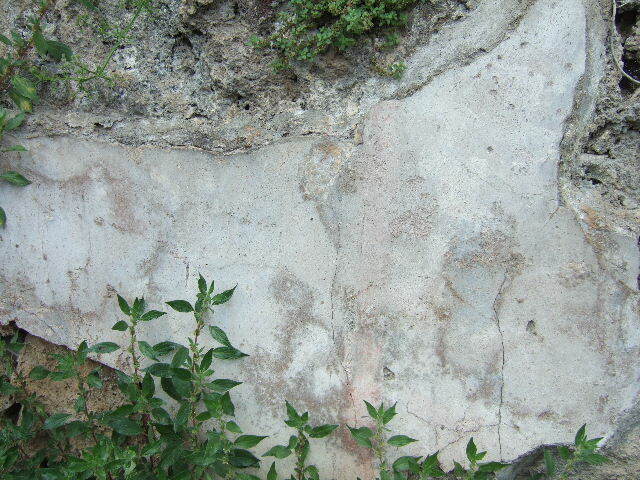 Remains of painted plaster on west side of entrance. 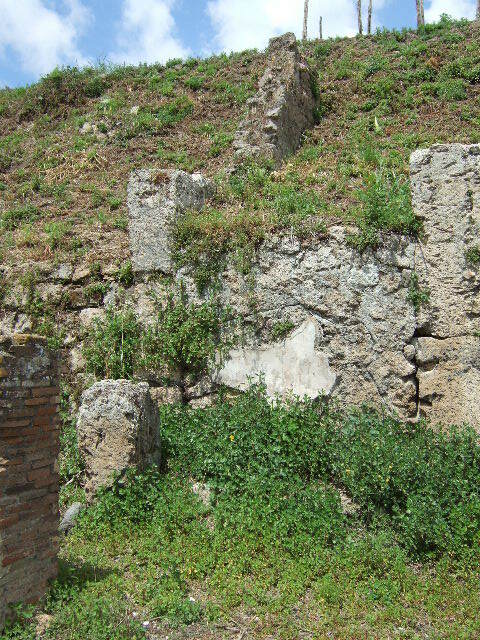 IV.2.a Pompeii. May 2006. West side of entrance. 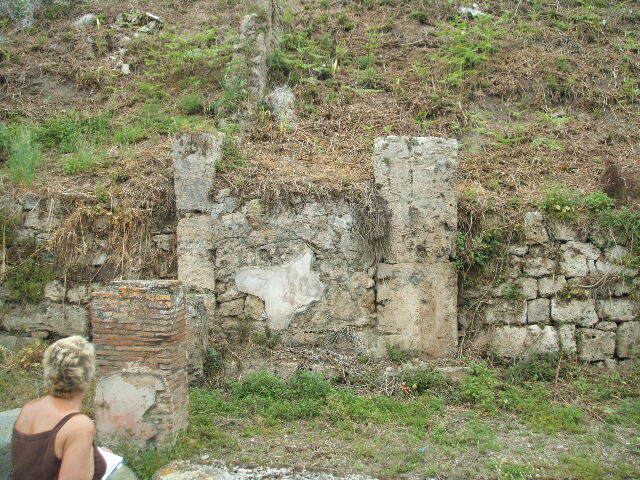 IV.2.a Pompeii. May 2006. 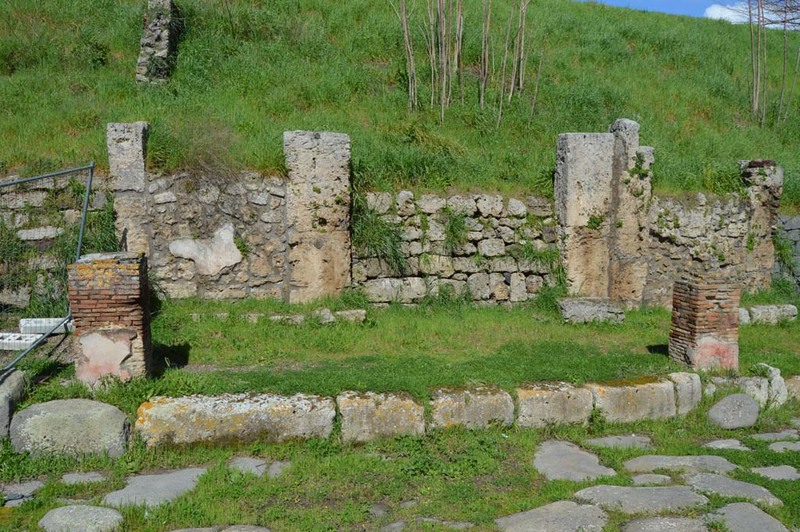 West side of small portico. 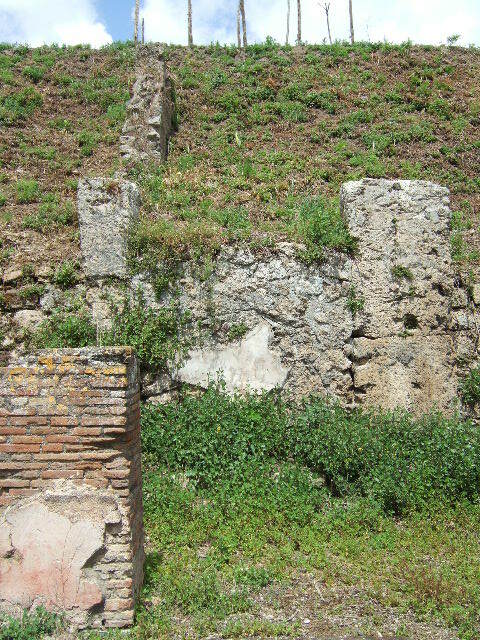 IV.2.a Pompeii. May 2006. Detail of painted plaster on west side of entrance. IV.1. 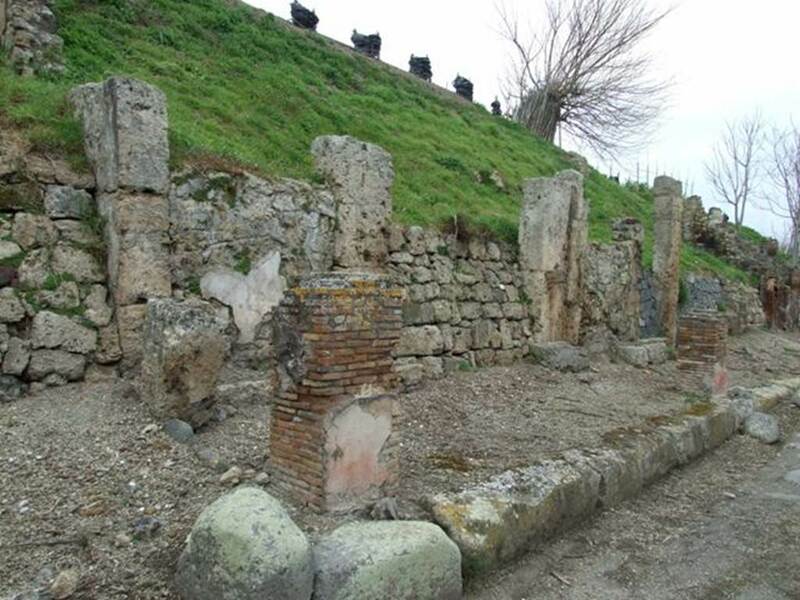 Pompeii, on left. March 2009. Blocked unnamed vicolo. IV.2.a, on right. IV.1. 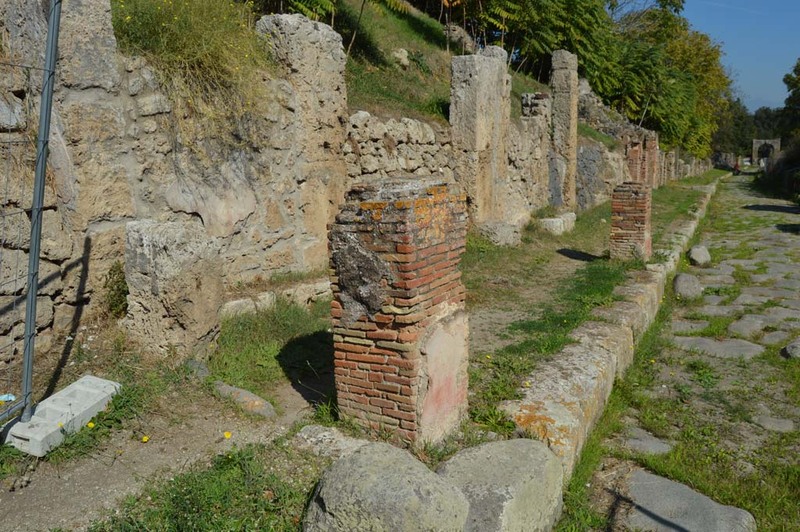 Pompeii, on left. May 2006. Blocked unnamed vicolo. IV.2.a, on right.